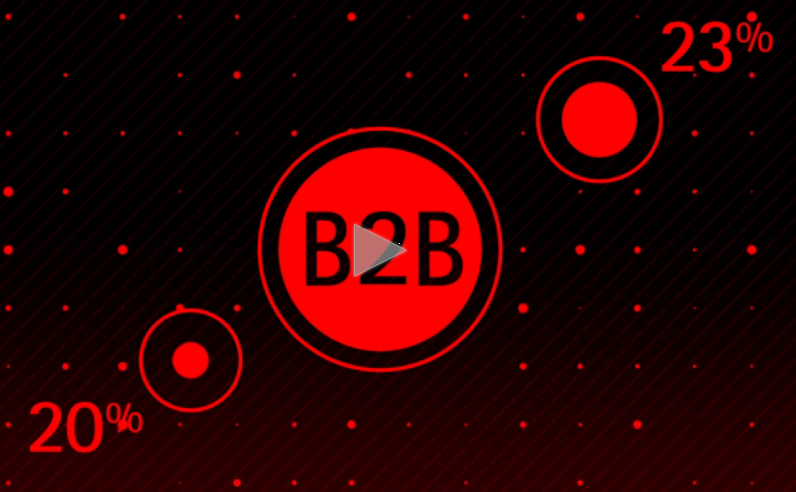 According to Rion Martin, marketing director at Infegy, and an expert on social media intelligence, incorporating social data into market research can massively impact a company’s marketing initiatives. It enables market researchers to ask better questions, using relevant language, and it helps structure new research models. 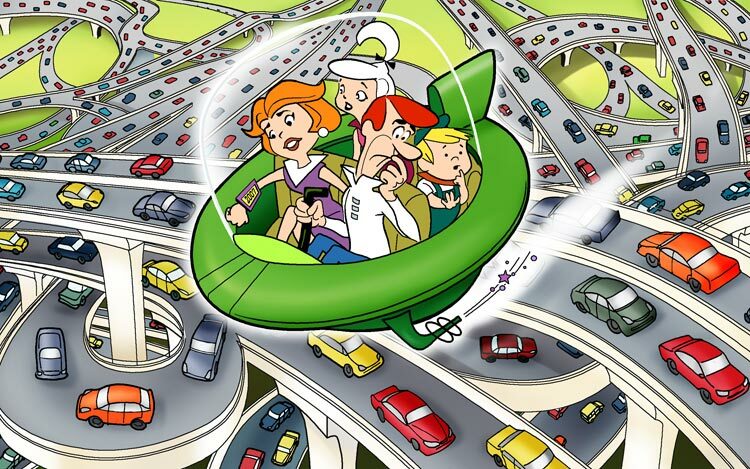 And data-backed recommendations are always preferred to mere personal hunches. 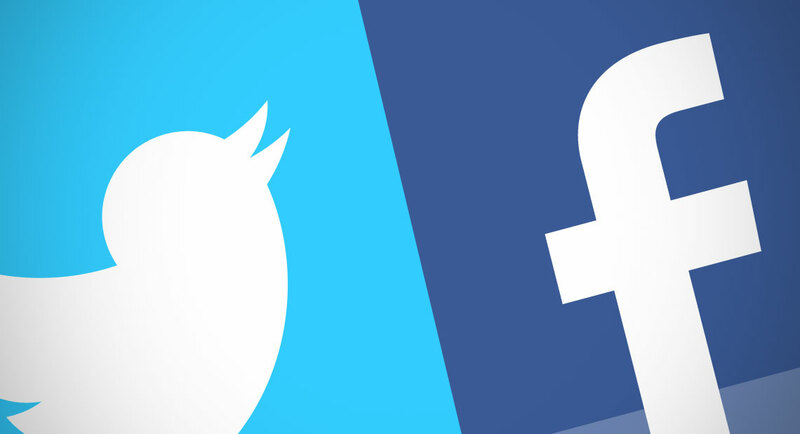 Both General Motors (GM) and Jaguar discovered the mighty power of social data in recent years. Just last year, GM’s faced a massive ignition recall. The growing dilemma went through several stages, from February through to July. 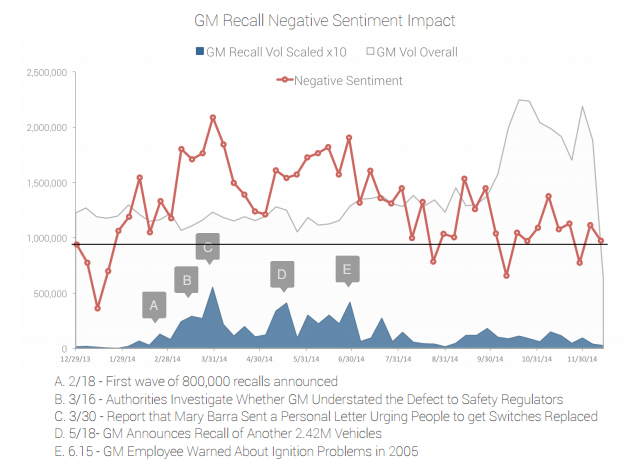 A study found the company’s negative brand sentiment on social peaked on March 30, 2014, declined rapidly, but was then stabilized amid ongoing reports that GM may have hidden the defect and high ranking members of the company were aware of the problem long before it became the center of public attention. 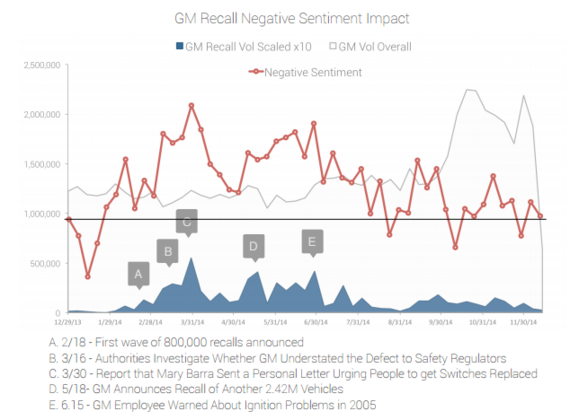 While lasting upward trends seemed to settle after six weeks on the product recall timelines, the overall impact on consumer opinion compounded over time measurably, negatively effecting brand affinity. GM learned this the social way. For Jaguar, the lesson was in the automotive repair side of the business. The company had begun noticing a decline in customer visits to its dealerships for routine maintenance activity. 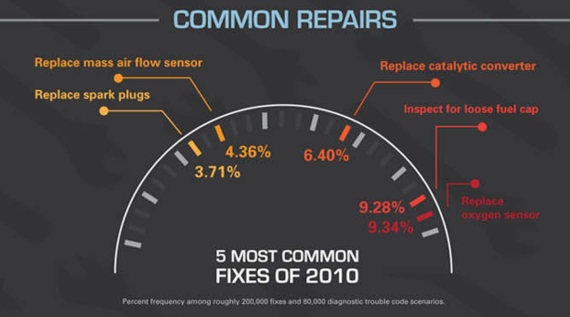 Dealership automotive repair accounts for 22 percent of all servicing and customarily high hourly service rates represent a significant part of dealership revenue. This was of great concern for many reasons, but one reason in particular was the possibility that sub quality repairs made by independent shops could lead to negative consumer perceptions of the overall quality of the brand. Jaguar had addressed poor product sentiment before. Although Jaguar’s engines were regularly held in high esteem, in the United States, Jaguar had long been regarded as suffering from reliability issues, particularly with the electronics. The company worked hard to turn this around in the last decade, as brand sentiment became a critical measure of overall success. So Jaguar began looking closely at social data. 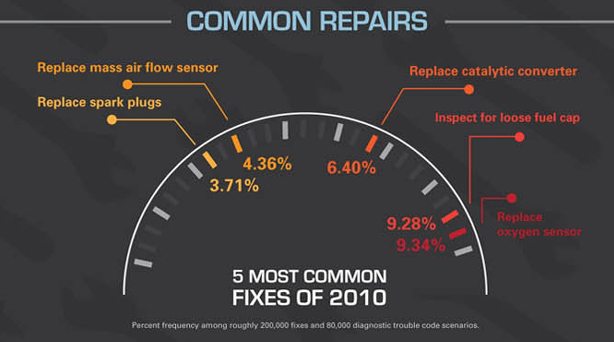 Their research found that when US consumers spoke about Jaguar and maintenance, independent mechanics represented 17 percent more of the total social conversation volume, with people saying they’d seek independent mechanics rather than Jaguar dealerships for maintenance and repair. 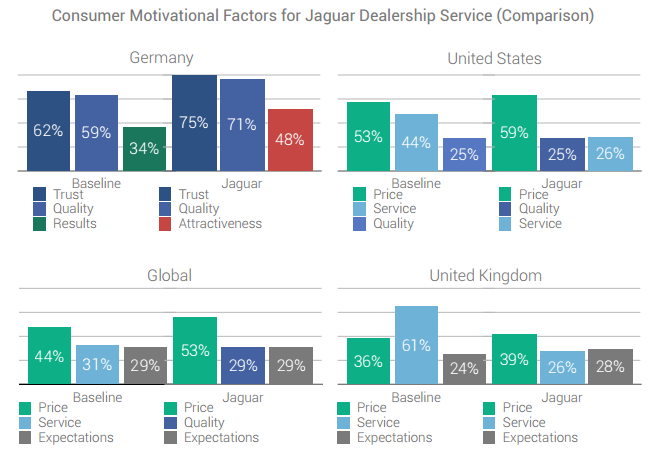 While Jaguar’s German customers spoke frequently about how easy Jaguar dealerships made it to have service performed by offering things such as complimentary loaner vehicles, the rest of the world didn’t feel the same way. The majority of conversations among US consumers were focused on price, which was discussed more positively than the baseline of all dealers. However, when discussing qualitative measures of service (friendliness, accommodations, experience), Jaguar dealerships did not fare nearly as well, with 18 percent less in positive conversations. 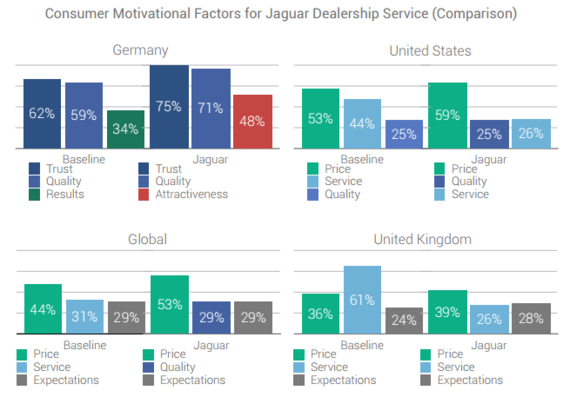 Consistently across the US, UK and general market, the findings suggested that consumers took their vehicles to Jaguar service centers because of high marks on what matters most to them: higher perceived quality of the workmanship and parts, price point position, and ability to meet expectations. In Germany, although price and cost of parts and service were of interest, trust and quality were the most important factors for choosing the dealership over an independent mechanic. With a better, social data-driven understanding of consumer motivational factors for each geography, Jaguar was able to develop marketing material to emphasize the selling aspects that mattered most to each consumer group.